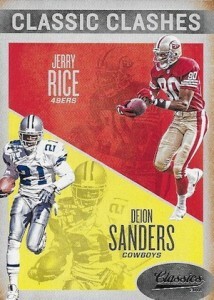 The 300-card base set includes current stars alongside Legends and Rookies subsets. 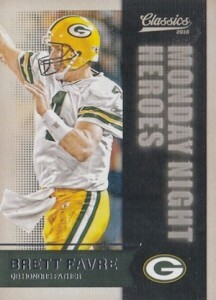 Every pack should yield one rookie card. There will also be rare parallels and other "exciting surprises" as noted by the initial sales info. 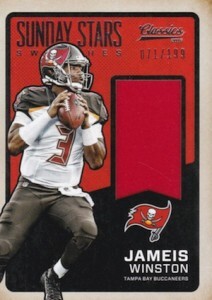 Each applying to the entire base set, this includes Red Backs that feature red ink on the backs, Blank Backs which have only the team logo and trademark info on the back, No Name Fronts, as the name suggests, removes the player's name from the front of the card, and Glossy parallels that showcase a glossy finish and further differentiate the parallel with "Glossy" printed on the front. 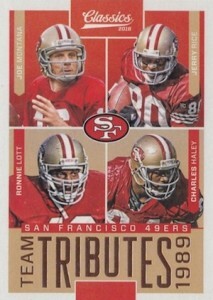 Bronze Glossy parallels are short prints. In addition to the base set, subsets and parallels, collectors can find 40 Short Print Variations that replace the more common player image with a different option. Beyond the image difference, they can be spotted thanks to the bolder ink text on the card back. Use our detailed 2016 Classics Variations guide for further assistance. 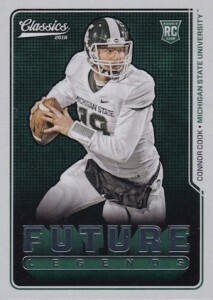 Autographs feature sticker signatures and come in several forms in 2016 Panini Classics Football. 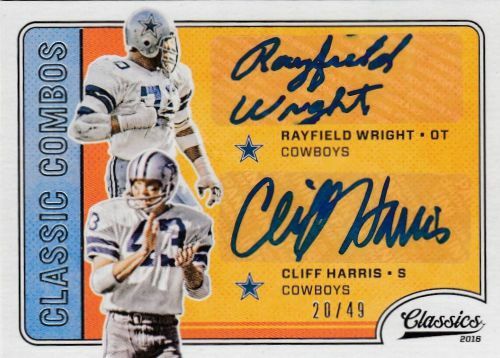 This includes Signifiant Signatures that offer autographs on the base design and Classic Combos Signatures that pair two NFL legends on the same card. 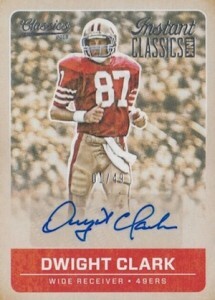 Buyback Autographs are a case hit and highlight the key cards of the past. 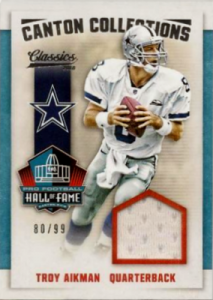 Combining notable players with relic pieces, memorabilia options include the Hall of Fame-themed Canton Collection Swatches, as well as Classic Material and Sunday Star Swatches. PARALLEL CARDS: Blue Back, Glossy - 1:9, Red Back - 1:15, Blank Back SP - 1:106 (PR=50 or less), No Name SSP - 1:422 (PR=10 or less), Timeless Tributes Bronze #/99, Timeless Tributes Silver #/25, Timeless Tributes Gold #/10, Timeless Tributes Platinum 1/1. 40 cards. View our detailed guide to spot the variations. 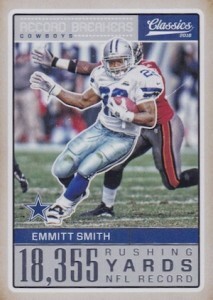 PARALLEL CARDS: Bronze #/40 or less, Silver #/25 or less, Gold #/10 or less, Platinum 1/1. 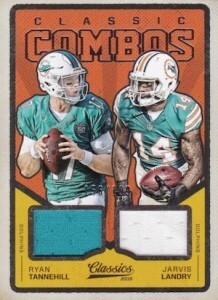 Inserts look nice but not feeling the base design. Might be better looking in hand but from those examples not so much. It’s hard to justify the price considering I’d have to buy several boxes just to get close to putting a set together. I can get the same amount of cards, inserts/autos and more rookies with 3 2016 Score jumbo packs for $15. Brady and Elway 1/1 buyback autos pulled out of first case from my LCS. Pretty lucky considering the size of the checklist. Avoid Panini products. On eBay this trash has a shelf life of about 24 hours. Case breakers have taken all the fun out of ripping packs because they flood the market with too many high hits at once, and prices plunge immediately. I cannot get anyone to even look at my auctions on this product. You are warned: Stay away. I love the product. I like sorting through all of the variations. 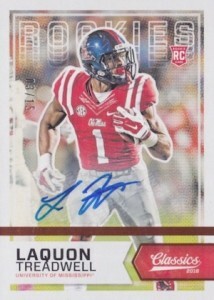 The big name rookie autos are tough to pull with the low print runs. Ive bought a few personal boxes and have been in about 10 master case breaks. You get a ton of cards and lots of sets to try and build. Cards are very nice. Autos are hit and miss. The buybacks are really cool falling 1 per master case. I usually do high end products, but this is a product that really defines what collecting is about. Its fun, fairly cheap, and something you can get the kids involved with. Weve had a blast with it. So I got a blue back card today. Don’t see that on the list of parallels. I had high hopes for these, but 200 SP in a 300 card set? Really?!? I bought a blaster and 5 loosies and ALL of the Legends cards were badly off-center. That’s unacceptable in this day and age. I was going to try to build this set, but after what I’ve seen so far I’m going to pass. 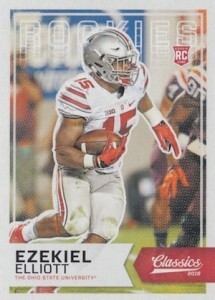 I pulled a Zeke Auto. 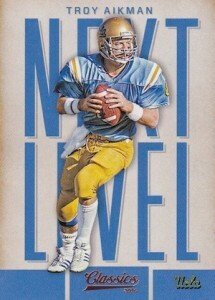 I only see him listed at /25. Mine is 9/10. Any ideas?? 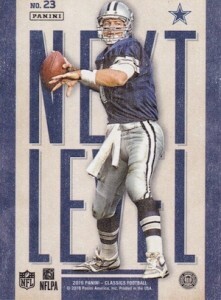 John � The base version for Elliott is #/25 but the parallels are lower. Yours is a Silver parallel. Love Classics, glad they brought it back. Perfect amount of base set sp’s for a set builder like myself. Difficult but not impossible. Gives the regular rookies some value because not over produced. Love all the variations, makes packs with no auto or mem. hits enjoyable because you can still get valuable short print or variation card. Love the mix of old and new. Great price point. Hate Panini as a company, worst customer service in the world. Still have 5 redemption cards from 2011 and 2012 that they won’t send or replace. Can’t get return emails or anyone on the phone. Hate giving them my money (Don’t often) but do like this product. I gave this product 4 stars because of the fun factor of set building and for the simplicity of design. In this age of refractors and foils, and mega hits., it is nice to be able to collect a basically designed set. My only criticism is that the amount of swatch cards could have been reduced. I believe there are 3 or 4 different subsets. It would have been nice to have combined autos and swatches.